In what is perhaps the most convoluted acronym created by the digital media industry to date, Nielsen is introducing the “OTA+vMVPD,” a TV household segment consisting of over-the-air (OTA) homes that also have virtual multichannel video programming distributor (vMVPD). Nielsen notes the segment is “small, but growing,” and that OTA+vMVPDs currently represent 1.2% of U.S. households, and have helped boost OTA’s overall coverage to 14.1% of U.S. households. 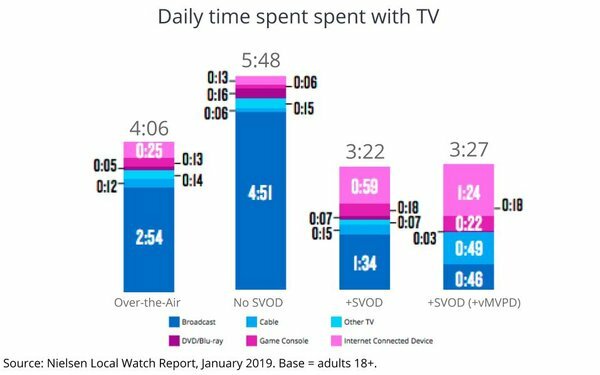 The OTA+vMVPD households also are typically lighter viewers of TV/video, but have markedly different share of time spent across platforms (see chart below).